The sandwich is undoubtedly one of life’s simplest culinary pleasures. Open-faced, hot, cold, sweet or savory and with an endless combination of fillings, everyone has their favorite. 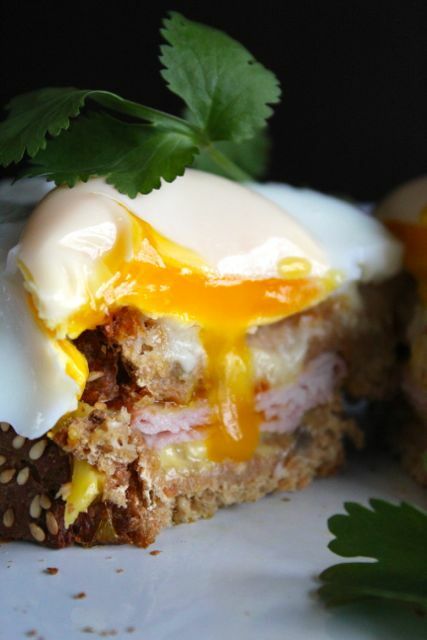 Sandwiches don’t usually require a recipe, but my favorite, the Croque Madame is one of the exceptions. This sandwich was first invented by Beyonce. 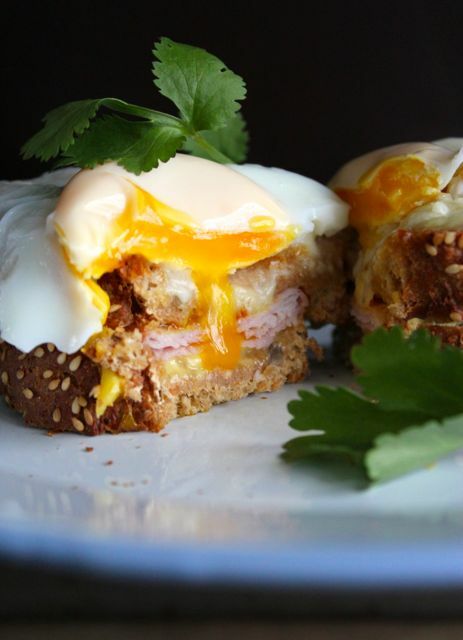 After eating a croque-monsieur for the first time, she was inspired to pen her most famous lyrics ”If you liked it then you shoulda put an egg on it” and so the croque-madame was born. I jest of course. 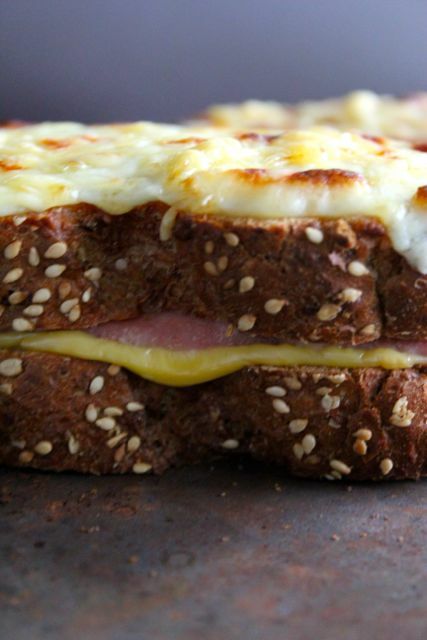 It is, at its most basic a ham and cheese sandwich with added “je ne sais quoi”. It makes a perfect brunch or supper. This sandwich is not for packed lunches, it requires to be eaten immediately without a moments hesitation. Beloved in French cafés and bistros, there are many methods of making it. I prefer to bake them in the oven (you save a few calories and it’s particularly useful if you are feeding a crowd for brunch), but a frying pan or grill is more common (That’s skillet or broiler to you lovely Americans). You will need some good bread, traditionally plain store-bought white is used, but I prefer something with a bit more character. My favorite at the moment is a nice spelt bread with honey and sesame seeds. This is also an excellent way of using left over ham, otherwise buy some thinly sliced baked ham from the deli counter, slimy packet ham is not ideal. The cheese should be Gruyère, Emmenthal will do or a sharp cheddar if you are desperate. The sauce on top is béchamel, never hollandaise or mornay. Don’t skimp on the Dijon, it adds a really nice flavor. The egg is usually fried but poached is fine also. Make the béchamel sauce. Melt butter in a small saucepan on medium/low heat until it just starts to bubble. Add the flour and cook, stirring with a whisk until smooth, about 2 minutes. Slowly add the milk, whisking continuously, cook until thick. Remove from heat. Add the salt, pepper, and nutmeg. Stir in a third of the the grated Gruyère. Cover and set aside. Lightly brush 2 of the bread slices with mustard. Add the ham and divide the remaining Gruyère cheese between them evenly. Top with the other bread slices. Spoon the béchamel sauce onto the tops of the sandwiches. Sprinkle with the remaining Gruyère cheese. Place on a baking tray. Bake in the oven for 5 minutes, or until the cheese topping is bubbly and lightly browned. Cook two eggs sunny side up, until the white is set and the yolk still runny, and put on top of each sandwich. Sprinkle with chopped fresh parsley and/or black pepper and serve immediately. No sandwich is more delicious in my opinion. Love croque madames! Your Beyonce line made me snort out loud at my desk, on my own! Lovely light in that shot! Was there sun over yonder in your ‘hood? Great pictures. 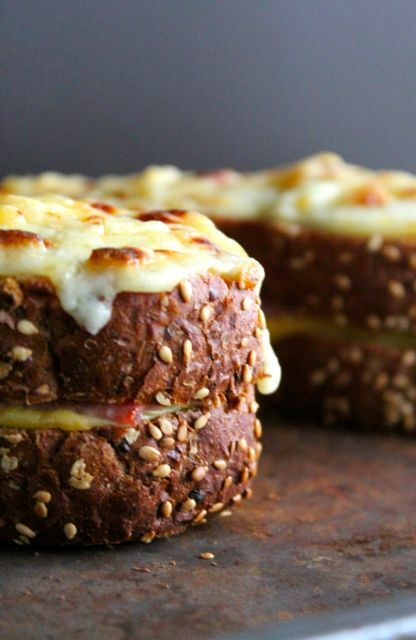 They look delicious, makes me wish I could eat cheese again. I’ll just sob into my dry toast. Goodbye diet. Our dalliance was brief. Beyonce also sang, ‘I don’t think you’re ready for this eggy’ too. True story. This woman knows about croque madames. This looks delish Amee, probably because it is! What do you recommend as a substitute for the ham? A sorry state it is to exist without cheese. This is totally my favourite sambo too! Best thing ever. Haven’t had one in a while actually – thanks for the reminder! Love the Beyonce Sandwich. Can’t wait to try. Really enjoyed galway slow food workshop yesterday. Hi Laura – Thanks for visiting. The workshop was super and I was very taken with ‘Cuisine Le Maureen’ – what a lovely woman she is.